I started conducting interviews here on AppUnwrapper, my first ones being of Her Story. After playing spy thriller Agent A: A Puzzle in Disguise and chatting a bit with Mark White of Yak & Co., creator, art director and game designer for the puzzle adventure game, I thought this would be a good opportunity for another interview. I’m asking Mark some of my own questions, but feel free to add your own in the comments section and I’ll include the best ones in my interview. AppUnwrapper: Hi Mark. Thanks for agreeing to this interview about Agent A. The game seems to have gotten a very positive response from players. Why do you think it’s resonating so much with people? Mark White: Hi Lisa. Thanks for the interview and also for the great review. I think it’s the game’s theme and visual style that are gaining players’ initial attention but when they get in, it’s the actual game and puzzle design that are really hooking them. We really tried to design puzzles in a way that make you feel clever when you solve them. For example, if you pay close attention you might spot a clue that helps you solve a puzzle… just like a good secret agent would! There are lots of these clues around, but they aren’t always obvious so you have to be quite observant. AU: I agree; the visuals are what pulled me in right away. I love the stylish appearance of the game. Like I mentioned in my review, it feels like it was designed for adults, but is still very kid-friendly. It also helps it stand out from all the other adventure and room escape games out there. How did you come up with that art style? MW: Thank you! The art style took a little while to shake its way out. After the spy theme was settled upon I started looking at some of Kevin Dart and also Shag’s art. Both incredible illustrators with unique styles that blend that retro 60s flair into a toony stylised world. I wanted to make it my own style, though, so I really got into investigating 60s architecture and furniture and in particular the textures. To begin the game, we actually started off with complete greybox sketch art. 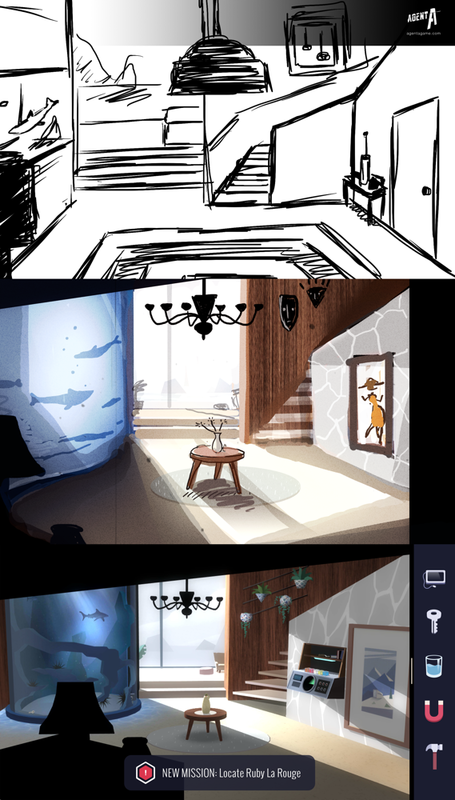 After that, I began painting rough colour thumbnails for each scene. This is where the hard shadows and bright light rays started entering into the style. It was mostly from just playing around and painting quick options. After that, I modelled the scenes and our lead developer Jason Rawlings came up with some creative shaders for Unity that allowed me to control gradients across flat unshaded surfaces. The end result is an almost 2D illustrative look, with sharp angles and hard shadows, but with all freedom for the camera to move around in a 3D world. AU: Ahh I don’t think I’ve heard of those artists before, but I just looked up some of their work and can definitely see their influence. Very stylish, indeed! And thanks for the early sketches. You and Jason did a great job capturing that design in an explorable environment. What was your inspiration for the story and characters? You mentioned that the spy theme came before the art style, but was the game always going to be a spy thriller? MW: Actually originally I came up with a different theme all together. The working title was Snowy Village and I actually built a playable demo to test on people. The art style was more in the Lost City style of art (photo paintings). One thing I learnt from building Tasty Tadpoles was that you never want to just jump into a project without properly testing it. So after I tested the game out on a few people I found that overall the puzzles and game design were fun but the theme wasn’t going to really hook anyone. So I began thinking of themes that would suit a game based around hidden rooms and secrets and naturally ended up on the spy theme! I’m a massive Bond fan, too, in particular the early Connery films, so it wasn’t too far of a stretch to end up on the secret agent theme! AU: I’m a huge fan of Fire Maple’s The Lost City, too. Very cool that you got some inspiration from there. I do love what you did with the spy theme and it does make a little more sense than objects and clues hidden around in nature. 😉 But do you have any plans to work on Snowy Village again after part two of Agent A is done? Or have you abandoned it completely? MW: Abandoned completely! Gone, Kaput!! Haha. Though I still think it was a good exercise to do because it ultimately led to the new theme which I love and also led to me asking my friend Jason Rawlings to help build Agent A with me. Originally I was planning on doing it all myself like I did with Tasty Tadpoles, but once I started to build Snowy Village and realised how much better it would be with a talented dev, I knew I had to ask him! AU: I suppose I can forgive you for abandoning Snowy Village, since Agent A turned so great. 😉 And that’s very cool that you’re able to do it with a friend. You and Jason seem like a great team! “First of all, gorgeous game. Have played it four times! I have a question for Mark, and it has to do with difficulty. How did you go about defining the level of difficulty in the game? Parts of the game, especially in the first part, runs along quite smoothly. The puzzle muscles barely break a sweat. It’s still very enjoyable, because the user experience is so smooth and well designed. It’s just so nice to interact with the game: good feedback on actions, good inventory, nice touch with the reward popups and the missions. The UX is just top notch in every way! So was this a deliberate choice, to make the game a little bit on the easy side? Did you do user testing to define this level of difficulty? MW: Hi Jonsa, thanks and wow you’ve played through 4 times; that’s amazing to hear! We love hearing those kind of comments because it means all our hard work was worth it, so thank you! We did err on the easy side at the beginning of the game because one of our plans was to open up this genre to an all-new audience. Because we did go for such a different visual style compared to most point-and-clicks, we thought it might entice new players in who’ve never played the point-and-click puzzle style before. So early on in the games, we designed a few easy puzzles to introduce players to the concept and also to feel good about completing a few things like the fish tank which is more like a little challenge than a puzzle. We also didn’t want to do any ugly instructions over the screen so we tried to make everything quite self explanatory, you learn the game at your own pace. During development we tested the game on nearly 100 people via Test Flight and adjusted the difficulty from there. We tried to ramp it up a bit towards the end and there are definitely times where most people will get a little perplexed, but hopefully still work their way through it! AU: I can definitely see where making it accessible to more people can be beneficial for the first part of the game. I, too, preferred the puzzles that made me feel clever and I would love more of those in the next part of the game. Do you think you can tell us anything about what we might expect in part two, without spoiling too much? MW: We are planning on ramping up the difficulty a bit for the next missions because to get to the conclusion of the first part you do need to be pretty savvy. So if you’ve made it this far I think you will be looking for a bit more of a challenge next! We will also be expanding upon the story elements that we planted around the house in part 1. If you look carefully you will start to put together some of the motivations behind Ruby’s actions, so we will start to delve into that more too. The puzzles that most people have said they really enjoyed are ones like the valve/water puzzles where you need to go back and forth and get really creative with your solutions. For me, I always feel clever when I feel I’ve noticed something that not many others would have and then I use that to solve something, so we’ll be adding in plenty more of those kinds of puzzles too! One of the things I mentioned in my review was how much I liked that you made Agent A genderless while still bringing him/her into the story. It means all the dialogue in the story has to work for any gender. Where did you get that idea and was it difficult to make it work? The idea to make Agent A genderless came early on when I was mapping out the target audience. I thought it might be nice to avoid showing the look of Agent A so that regardless of whether you are female or male, you can really get into the role of playing a secret agent. It wasn’t that I’d seen another game do it, it was just something I felt would allow people to feel more like a spy. Agent A still has a bit of a personality though, you can see it come across in the dialogue during the gameplay! AU: Yeah, I’ve seen it in other games, but usually the genderless protagonist has no personality in those games. So I was impressed that you were able to pull it off while still giving Agent A a personality. There’s a lot of talk about it being hard to make a successful game on mobile these days. Were you ever hesitant about publishing Agent A on iOS over other platforms? MW: No we didn’t hesitate at all because we love using the platform ourselves! I think perhaps the reports about the difficulty of making a successful game, in part, can be put down to the sheer number of games coming out each day. There is far more competition these days and with that comes more reports of developers unable to break even. One thing I feel with adventure puzzle games is that there will always be an audience though because as soon as you clock a game you want more right away. So we’re always looking for new content to play! And to me a touch interface is one of the nicest ways of interacting with these new age “point and click” style games. In the not to distant future we will be looking at expanding out to other platforms too, probably when we get a bit more content into the iOS version first! I agree — I’m always looking for another adventure game after I finish one. And touch screens feel so much better to me than a mouse and keyboard. I’m glad so many developers are noticing that iOS is a great platform for adventure games. So…I should be winding down this interview. One question that I’ve been getting from some readers and I’m sure you were expecting is, when do you think we’ll be able to play part two? Do you have any estimated release date? MW: No estimated time just yet! Aiming for early next year and it’s possible we might even split it up into smaller missions to get content out sooner. If we did do that we would have hard dates so that as you finish one mission you know when the next one is coming. Nothing’s confirmed just yet but we do have some pretty cool plans awaiting Agent A and Ruby! AU: Well, I’m looking forward to whatever content we get! 🙂 Thanks again for interview and best of luck with the rest of the game! Tags: Agent A, interview, iOS, iPad, iPhone, iPod, Yak & Co.
Mark! When is the new installment of Agent A coming out? I love this game!